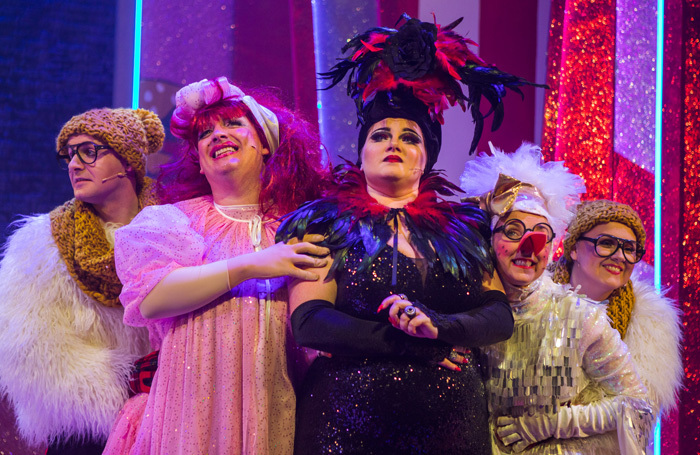 Farting geese and the spirit of Christmas: Andy Edwards reviews Johnny McKnight’s deliriously silly and subversive panto. Mammy Goose, written by, directed by and starring Johnny McKnight, is this year’s panto at Tron Theatre. Revered among those looking for a slightly alternative panto to those offered by the city’s large-scale venues, McKnight’s pantos (playing both at the Tron Theatre and Stirling’s Macrobert Arts Centre) typically offer all the best traditions of pantomime – with a few subversions thrown in for good measure. This year’s serving of Mammy Goose is no different – a joyfully spirited, progressive, totally daft night out, with surely more than enough farting geese to get you through the cold festive season. Mammy Goose (Johnny McKnight) owns a café in Maryhill, working alongside her best pal Lucy Goose (a 6ft goose, played by Julie Wilson Nimmo) and Jack (Darren Brownlie), her son who’s longing for something more. They’re struggling to get by serving only tea and coffee, until along comes Vanity Visage (Lauren Ellis-Steele), evil queen, with her son, Will (Ryan Ferrie). Vanity offers Mammy Goose a solution to all of her problems – but at what cost? What follows is a romp through love, loss, fame and fortune, as the Goose family go deep into the heart of Wetherspoons in a bid to save Christmas, find true love and get Lucy Goose out of the oven. At the forefront of the work is McKnight, creator of over 14 pantomimes and counting. He knows the form inside out and this close relationship to the material is evident throughout Mammy Goose, as he continually strikes a balance between giving the audience exactly what they want – hitting the panto beats, “look behind you” etc. – and varying the routine exactly when needed. McKnight really understands his audience – which on a night containing families with kids in the front row and screaming drunk hecklers in the back is pretty varied. Somehow, he keeps the whole thing going, connecting with everyone in the room, giving everyone something to laugh about. No more so is this evident than in his performance as the titular dame – he makes it look easy though it is surely anything but. Uproariously funny, he is never cruel to his audience, always good natured, delivering a pantomime that is thoroughly for them, and couldn’t happen anywhere else – it wouldn’t make sense quite like this. Ultimately, it’s a love story. Jack and Will’s romance wins the audience’s hearts from the off, and it is their duet of Love is Love (part of a well-pitched original composition from Ross Brown) and eventual kiss that nearly takes the roof off the building. Placing a gay male romance onstage as part of a panto may be quite unique (I’d have to see other pantos in Glasgow to confirm this theory) but what’s most notable is the atmosphere of support – and, forgive the Christmas mush – love, that’s allowed into the room. In one moment, mid dance, the two lovers upend an Ariana Grande duvet spread to reveal a pride rainbow printed on the other side. They lay it down under the lights, so that it takes centre stage. It’s a wonderfully handled moment. The whole of Mammy Goose comes together in a way that is hugely impressive for a mid-scale touring venue, operating on a significantly smaller budget and more than holding its own against the other pantos in town. Kenny Miller’s design is big, bold and 99% glitter; I stumble out blinded by the set, the costumes, and marvelling at the set changes. Performances too are strong across the board with Brownlie’s bright eyed and charming Jack sure to steal many hearts, but Wilson Nimmo as Lucy Goose, who manages to make an endless array of fart jokes (and egg shitting) incredibly endearing – a feat I didn’t realise possible, in a Christmas miracle of a performance. As always with panto, it is the moments that are unplanned that are the funniest. Several times the whole evening seems to break down – we’re only two nights in so god knows where this is going to end up. This appreciation for being unprofessional, for the joys of things going wrong, is the part of panto that keeps me coming back to it. McKnight creates ample room for this to happen in Mammy Goose, offering just enough plot for the evening to make sense and a second half where the plot takes a back seat (and perhaps even disappears). Running at two and a half hours yet never outstaying its welcome, there’s a glorious amount of mucking about, with time left over for the obligatory birthday shout outs and audience dance-off. And they belt out Mariah at the end – perfect. Mammy Goose is at the Tron, Glasgow until 6th January. More info here.